"I think we are lucky it hasn't exploded alredy. Some ninjas say the valcano has feelings and is celeberating holloween with a storm. Others say it is not a threat because it has always been there before. I for one have no idea and I am pretty shure sensei is the only one who knows for shure. Then again maybe even he is puzzled by this amazing firery mountain! (Waddle on CP and plz post!)" For next week, Club Penguin wants to know, "What do you think it would be like if your penguin shrunk?" Saweet! The new Norman Swarm play sounds awesome! I think there will lots of extra large stuff to make the penguins look like they shrunk. How coolio is that? Be sure to post a comment about what you think it would be like if we all shrunk! Yup. Kewl. Mini penguins. Nice. If my penguin shrunk, I'd be able to walk under igloo doors. After that, I'd eat the biggest item in their house so that I can grow bigger to tease them when they come home that I can reach the window when they can't! Ha ha ha! So funny! Bwah Penguin crew JUST beat You dude awesome site, not been here a while rofl WEBO PARTYS ROCK! i think it would be cool i reakon they should do a suit then when you wave/dance it makes you shrink or like you said big clothes. If we all shrunk, would we be puffles' pets? I don't think a volcano has feelings I mean come on it's a volcano! all though it could be something like a secret base somehow or it could become one and if it is already run i bet zebras run it and are planning to attack!! if we were shrunk we would have trouble eating pizza,go take a walk would be very hard,so much things so big! !mimo rocks! I think the special kind of stone is a bit of rock of a volcano! O yeah and whats the point of banging a gold anvil when theres NO amulet on it! Yeah we are kinda lucky, but it would be cool to have a lava party! Nad that in ninja hideout it would be some special thing there. I would hunt ants! Althogh they will be igger than us! Mimo what about you! P.S. Plz make me a CPGMOD mimo! Wow that post is really good(except the exploding part...lol...)! I'd get my squidzoid costume and step on penguins lol! If all penguins shrunk we would swim in the pizza! Lol swim with the dead fishys! We will find out soon! Or we might turn into gnomes lol. Maybe, but we can fight them if they get to mean right? Hopefully they are nice to us if that happens but then again if we shurk the puffle might not even cared that were small right. i would crawl in side carl(because he ate cp) and play! You can see the storm in the binoculars. Kewl. ----------------------------------- Dear Anonymous, It depends if there are puffles in the play. I think it would be really cool if my penguin shrink, then again not. There is always ups and downs to each situation, I believe. The up side of the situtaion is that if penguins shrunk on CP we could get into small doors and maybe even discover a new room, then again that room may just be a trick also. We never know what could happen on CP do we? Hey mimo are you going to still have a party? Or did I already miss it and you didn't make a post about it? I can beat that. (I wish I couldn't)I had like 8 tests this week because I was sick and missed a bunch of days. Also two of the tests I could have taken any time but I procrastinated and waited till the very last minute. Lastly my teacher hates me. Not even joking she hates like 5 or 6 kids and I am one of them. Why? The world may never know. Mimo in the newspaper on page b4 hover ovet the yelloe penguin and there will be a emote! Not necessarily. Being shrunk could vary quite a bit. You can shrink 1 100th of an inch or you could shrink 5 ft. Now I don't think that CP will make us shrink 1 100th of an inch. Just trying to make it clear that it could vary. I think I know what that mysterious blaack stuff in the middle of the amulet is! 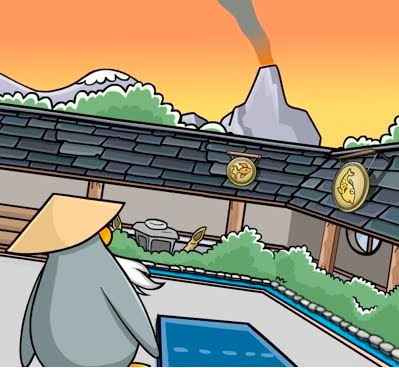 It may be that rock on the right in the Dojo Courtyard because there is a paper to the left of it saying there should be an axe hitting it! It's also cut in half! Depends how small you shrink. But puffles are pretty small so I'm not sure. Sorry, but Mimo can't just make you a mod when other ppl out there are actully working for it, you have to answer questions. For furthur details go to the side post where it says CPG Mod's and you can click on the link. B.T.W. please don't put (CPG Mod)unless you're helping or answering someone's question. ~~~~~~~~~~~~~~~~~~~~~~~~~~~~~~~~~~Oh yeah! I forgot about that, I didn't go either if it already passed, but Mimo usually always tells us where it was and stuff after the party. If my penguin shrunk I would see what it was like to be a puffle so I would play puffle round up and I wouldnt be rounding up, I would be rounded up! Lol can you imagine when you were playing puffle round up you saw a penguin playing a puffle? Lol! But I think the penguins would be harder!